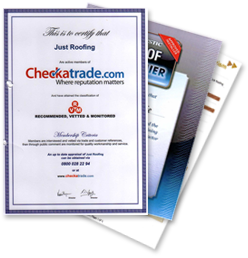 Just Roofing are specialists in Fibre Glass Roofing or glass reinforced polyester (G.R.P) - All our tradesmen are fully qualified & approved installers of CrysticROOF a specialised system and technique for the best Fibre Glass protection and surface finish. All work is carried out with the exacting standards of workmanship and come with a 20 year material guarantee. CrysticROOF is a durable replacement for traditional roofing materials such as bitumen, felt and lead. Suitable for roof structures, walkways and balconies. Complex roof shapes whether flat, valley or pitched are also easily constructed. What is Glass Reinforced Plastic (GRP)? GRP is the material of choice in many industries. It is used to make a large variety of items from luxury yachts, to parts on buses, trucks and trains, to garage doors, caravans and sports cars. Companies have been making parts out of GRP for over 60 years and Scott Bader Company Ltd has been supplying the industry since its formation. Scott Bader worked in partnership to help manufacture the 1st ever GRP boat and is renowned in the industry for innovative, high quality products backed by unrivalled technical expertise. In simple terms, GRP is a mixture of polyester resin with glass reinforcement, coated with a polyester topcoat to give improved aesthetics. 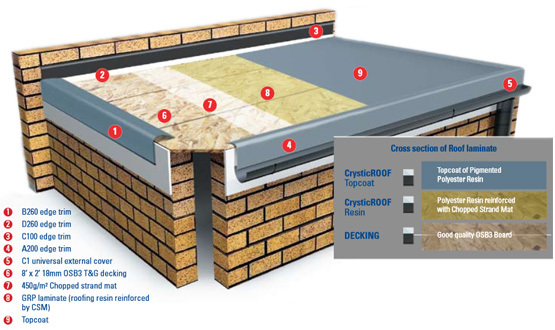 What is the CrysticROOF system? CrysticROOF resin and topcoat is manufactured by Scott Bader Company Ltd in Northamptonshire. The formulations have been specifically designed to provide a long-lasting, durable flat roof that will not crack or leak in any weather conditions and will stay maintenance free for many years. Base resins have been carefully selected in the formulations to impart the durable properties needed in the system. Re-blended resins are never used and the products are manufactured to very tight quality specifications. A GRP roof in simple terms is a standard boarded roof (usually sterling board OSB3) covered in a layer of fibreglass (polyester resin with glass reinforcement) and coated with a polyester topcoat. It is very tough and cannot be cut with a knife so provides a very strong roof structure.